Sleep In Heaven was rated the best in Denmark at the 2010 and 2012 Hoscars. It's located in the multicultural area of Norrebro, near Assistens cemetery and about 10 minutes' walk from the metro going to the city centre. 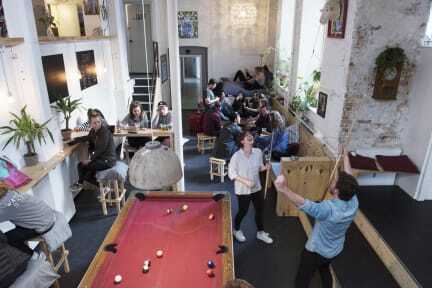 Hostelworld guests have said this lively hostel is surrounded by 'second-hand stores and alternative bars'. They've described the staff as 'warm, friendly and informative'. This large hostel features an outdoor terrace, bar, pool tables and keycard security. Prefer Brooklyn to Manhattan, Kreuzberg to Mitte or Brixton to Soho? Then Sleep in Heaven in the lively Nørrebro area is where you’ll want to live in Copenhagen. Sleep in Heaven is a modern youth hostel with newly renovated rooms, key card access and lockers. Bedlinen and free Wi-Fi is included. The hostel bar has daily happy hour and the spacious common area offers great music, free guest computers, a pool table, board games, comfy couches and plenty of chances to meet other travelers. The small beer garden makes a perfect hangout spot in the warmer months. The hostel offers plenty of tips to the obvious and less obvious parts of the city and the friendly staff will help you make the most of your days. The hostel has a perfect location for those wanting to check out the tourist sites during day and hang out in the best part of town at night. It’s an easy walk to the city centre and the nearby buses and metro makes it easy to get around the city. And on top you have the coolest part of Copenhagen right around the corner. Sleep in Heaven is situated in the heart of Nørrebro, right by popular parks and surrounded by the best bars and clubs in town. From dark indieclubs to the hippest electro, from old smoky bars to arty cafés, from top rated restaurants to cheap Asian take away places and Turkish delis - Nørrebro has it all. This is where the artists hang out on weekdays and where the university students prefer to spend their weekends. 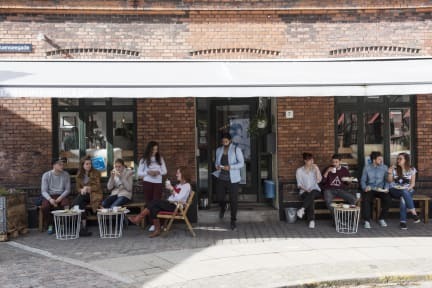 There’s a reason why Copenhageners prefer the diverse and lively Nørrebro to the touristy city centre. Come stay with us and find out why. Age restriction in dorms: 16 - 35. Age restriction in private rooms: 16 - 45. No kitchen facilities, but you are welcome to bring along your own food inside the hostel. Our team will be happy to provide you with plates & cutlery and recommend good and cheap takeaways around the neighborhood if needed. Bookings for more than 9 people are not accepted and will be cancelled (without a refund of the deposit and the booking fee). Maximum stay is 14 nights. We had a great time. Awesome hostel in a great location, with some super friendly and helpful staff. The hostel is located in an interesting neighborhood a bit off the beaten path. It was a really interesting area in that it did not feel super-touristy, but more of a medium busy area full of locals. Even with all that, the hostel was maybe 5 blocks away from the metro, so it was a very good location for seeing the city. The staff was very friendly and the hostel had a cool vibe. It felt almost like a loft space which I really appreciated. The showers with the best water pressure are closest to the toilets! I loved staying at this hostel, I would consider it very good, if not excellent quality for its cost. Staff is very kind, willing, and helpful. The bar is really nice, and I found the quarters and common areas to be really neat . Lockers are in your room and are opened with an assigned key card, as are doors in the hostel. There is wear and tear here and there, but that's expected. This place is very clean for a hostel! Super nice hostel. There's a lively atmosphere in a spacy common area where it's very easy to meet people. The staff is super friendly, facilities are clean. Only things to keep in mind is that there's no kitchen and it's half an hour's walk to get to city centre. Great place in a great neighborhood with fantastic staff. It was very accessible from both the airport and the central station. A little far from areas of interest, but in a cute neighborhood for food. Small rooms but spacious showers and lockers. Perfect for a one or two night stopover. The hostel is one of the best hostels I've stayed in. the only problem or concern I faced was about having my room in another building and that area didn't consist of any common room where we could sit and relax. rest was all good. I think our hostel is ideal for backpackers and students, travelling alone or in smaller groups, who want to experience the unique culture of Copenhagen and especially the sprawling and urban atmosphere of Nørrebro, the hip neighborhood. We like to have fun around here, whether it's socializing in our huge chill-out zone or relaxing in our candlelit beer garden. There's also foosball, pool and other games and if you want to go out the local bars and clubs offer our guests discounts and free entrance.